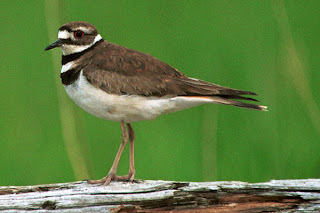 We've got a nesting pair of these in the middle of the Gewurztraminer block at Township 7 Okanagan this spring. There's four eggs in the ground nest right beside a trellis post. When we get too close in our work, the nearest adult bird puts on the traditional broken wing display in an attempt to lure us from the critical nesting area. Dead serious for the bird, very funny for the humans.